← Cheese Soirée at Whole Foods Market Unionville! 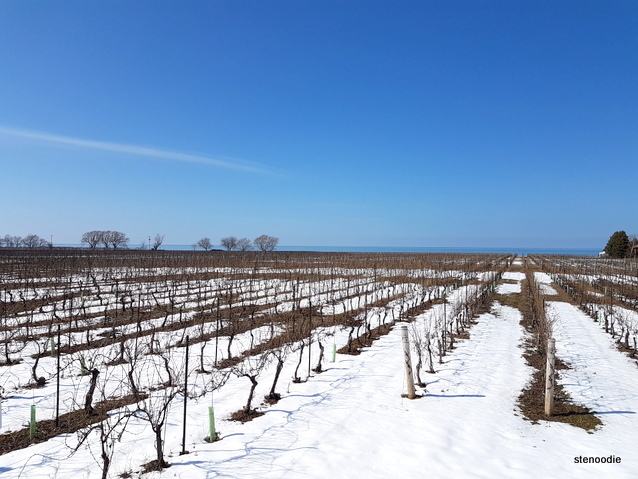 After our brief stint at the Chocolate F/X chocolate factory, we proceeded along the route towards Niagara-on-the-Lake and visited Konzelmann Estate Winery. The hotel stay was so awesome in that we also received a free voucher to go wine tasting at this winery! 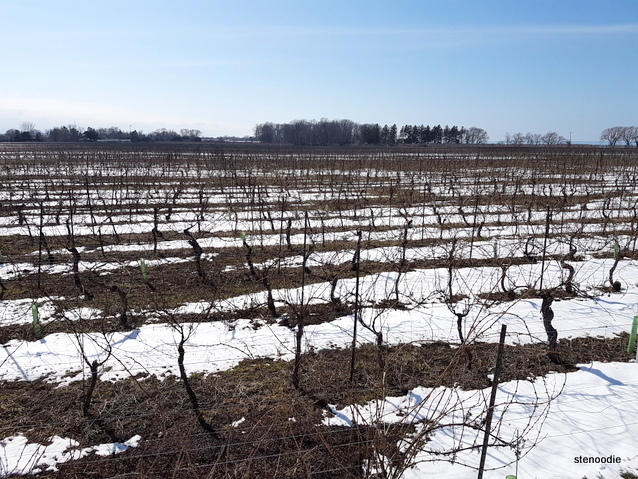 I was looking forward to it since there are so many wineries in Niagara and Niagara-on-the-Lake, of which many are well-known in Ontario. We arrived right at 2 p.m. and upon greeting the host, Gus, who accepted our voucher, the wine tasting and tour began right away. We seriously arrived right on time. If we had walked in any later than that, we might have had to wait until the 3 p.m. tasting and that would have put a damper on our plans. Anyway, it just so happened that there was only one other couple besides us on the tour. Thus, it was a very private wine tour and tasting that we received. It was a really fun experience! 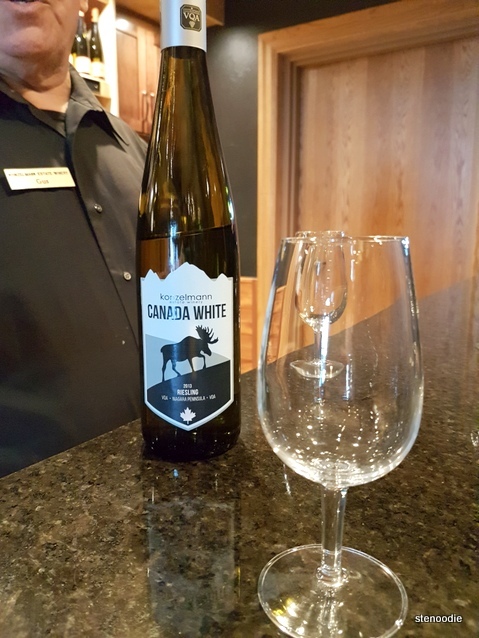 Gus was a really great tour guide and wine connoisseur who spoke at great lengths about the Konzelmann Estate Winery as well as the wines themselves. After a brief history about the winery (Konzelemann brought this all the way from Germany to Canada), Gus led us outside where we saw the machinery that churned and separated the grapes mechanically from the twigs and bugs (spiders!) that may be included as part of the harvest. The grapes used to be picked by hand, but as of a couple of years ago have now been changed over to mechanical means of picking. 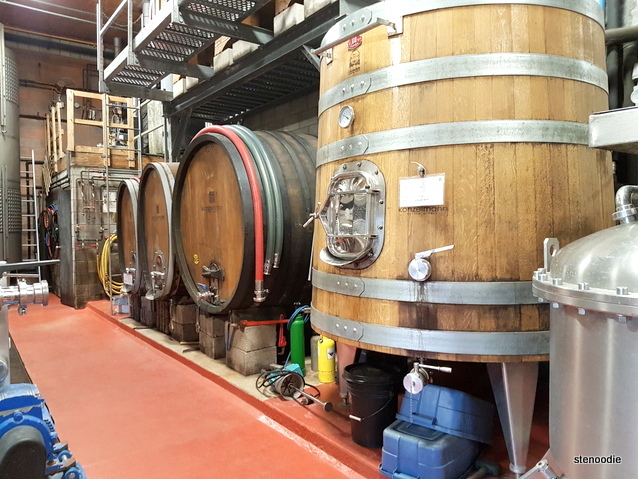 We also entered the room where all the fermentation occurred for the wines. It smelled so strong of wine in there! Mmm. Then, we returned back inside to the tasting room where we got to taste four Konzelmann wines. I took extra pleasure in learning from Gus about the four steps to drinking and/or tasting wine properly. I didn’t know about this before! Smell the wine. This wasn’t the swirling and wafting that people commonly do yet but instead, Gus taught us to cup the wine glass between the bridge of the nose and the bottom of the nostrils such that the entire nose was inside the wine glass. This truly helped to concentrate the smell of the wine and we could smell it directly. 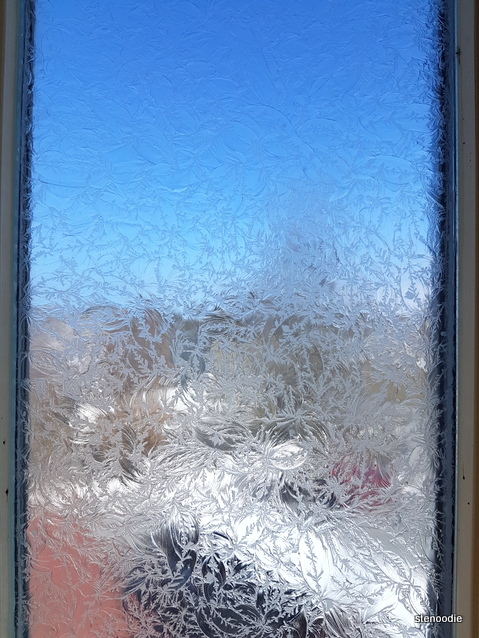 Swirl the glass. After swirling it, cup the wine glass to your nose again in the same way. We were able to smell the freshly wafted aromas of the wine even more strongly now that the glass had been swirled. It was an incredible smell! Before drinking, take a little bit of the wine and swirl it inside your mouth first to get rid of any tastes that were inside your mouth. This way, when drinking the wine afterwards, you will be able to taste its true flavours. As such, we tasted four wines that day: A Riesling, red wine, peach wine, and a sweeter late harvest (November) wine. I liked the Riseling the best since it was so smooth and flavourful. The red wine was a bit rough for my tasting. The peach smelled incredible but its actual taste didn’t match up to its smell — it barely tasted of any alcohol content too so it would be easy to get drunk on this without realizing. The late harvest wine was very, very sweet! After this, our tour had come to an end. Again, Gus was an incredible wine connoisseur and tour guide. His passion for the wines truly exuded in his speech and mannerism. It was a pleasure to be on such a great private wine tasting with him as the host. 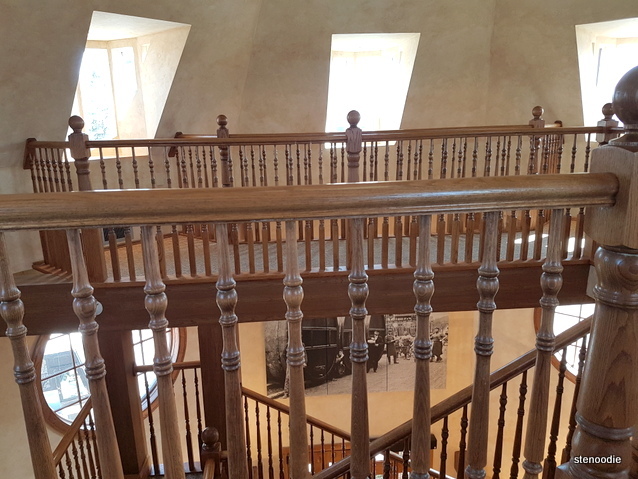 After this, we went upstairs to the lookout area where the building was purposefully designed so that you could look out its windows to see its vineyard which extended all the way to Lake Ontario. 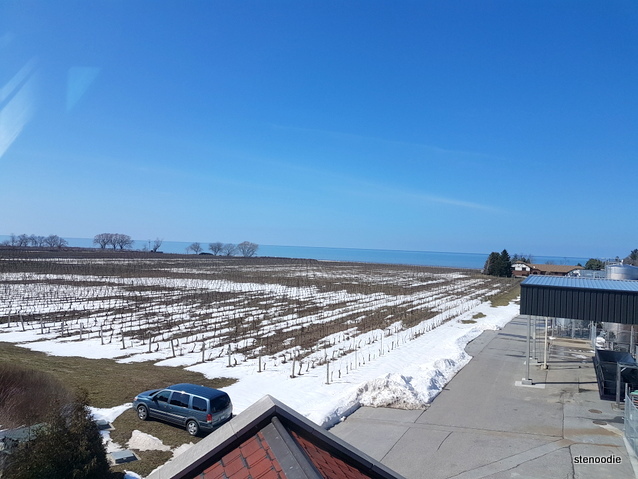 Konzelmann is the only winery that has land extending all the way to the lake. What a beautiful view it was! Gus told us that on a clear day, we could even see all the way to downtown Toronto. Wow. 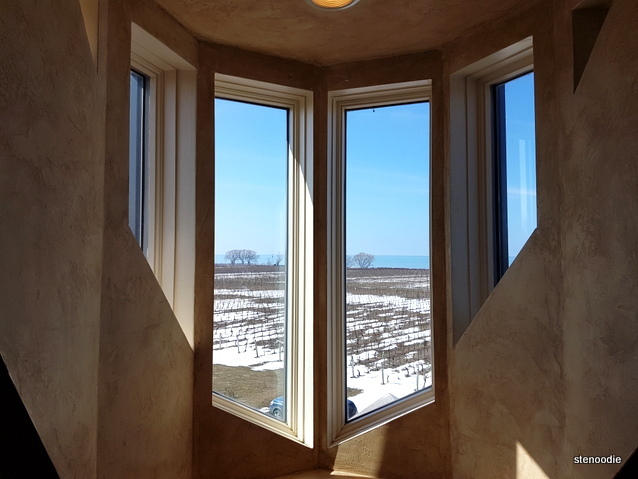 Beautiful windows looking out at the vineyard and to the lake! We also checked out the wine shop where there were a lot of tourists visiting from out of town via tour buses. 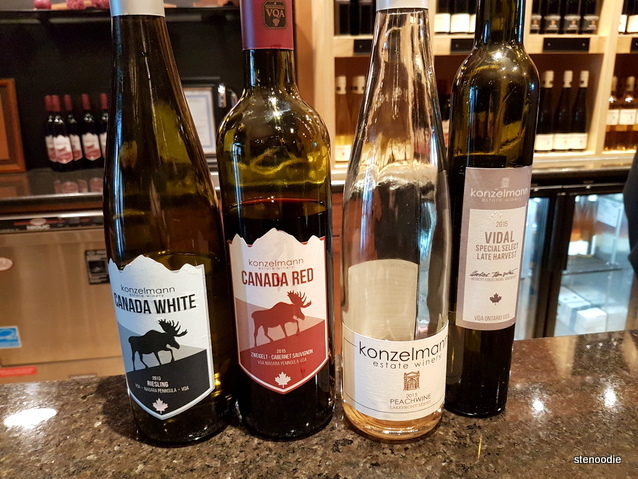 This entry was posted in Food and tagged 1096 Lakeshore Rd, @konzelmann twitter, Konzelmann Estate Winery, Konzelmann lake view, Konzelmann Riesling, Konzelmann vineyard in March, Konzelmann wines, late harvest wine, Niagara on the Lake, Niagara's Only Lakefront Winery, peach wine, red wine, Riesling, wine tasting, wine tasting tours in Niagara, Wineries in Niagara. Bookmark the permalink.